Read my previous summaries of the conference: one and two. This is the third and final part of my Web Directions South wrapup. The closing talk on the first day was by Chris Wilson, an Internet Explorer Platform Architect from Microsoft. 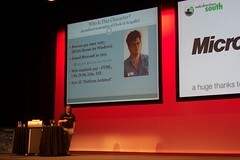 He opened the talk with who he is and what he does and put up this slide of his haircut from the 80s – I’m guessing. He asked if anyone remembered the Mosaic web browser. A fair amount of people did, including me. His talk was about moving the web forward, but because he’s from Microsoft, there was a lot of talking about their web browser and its use, or not, of standards. He said there were three main groups of people when it comes to web users. That is 1 – developers – and he acknowledged it’s painful for this group (think numerous hacks to get pages to work in different web browsers). 2 – browser vendors – browser hacking is lucrative and security is hard (think numerous browser security patches). 3 – everyone else – have to consider browser upgrades for this group. He did say they’re working on a new web browser and committed to working with standards, and it will have to work for his ‘mom’s banking’ otherwise he’s in the poo because she has his cellphone number and can hassle him. There’s no rhyme or reason to the order I’ve summarised what I heard at the conference, so I’m jumping to the morning of day two and Scott Berkun’s opening talk The Myths of Innovation. We were lucky to open with this and to close with Mark Pesce, it helped make a great day. The less you use the word innovation, the more likely you are to innovate. It’s hard to define what the word actually means. I liked this because it made me think of team meetings at work where we discuss innovation a fair bit. To innovate though, you need to delegate responsibility, allow mistakes – as they will be made, and reward initiative. Google have a 20% rule. That is one day a week is your own time to play around and hopefully think up some great new ideas. This was 3M’s idea from the late 1940s. Someone at the end asked how to get people on board with a new innovation and Scott said to involve them in the process from the beginning as they’re less likely to feel threatened. He’s written a book about the Myth’s of Innovation and after listening to this talk I’d really like to read it. Personas for web testing are often shallow, they don’t usually consider users with disabilities. A W3C check doesn’t mean the site is accessible. A software accessibility tool can’t check for things like contrasting colour. A holistic approach is needed. Role specific checklists are a good way to go. Therefore each person throughout the process of building the site has a checklist of accessibility items to check off. The person responsible for the front end has the most items to check off, but accessibility is not their sole responsibility as other team members have items to check also. Our website at work has been following the accessibility guidelines for four years now and quite often when talking to colleagues who are responsible for content and front end development, accessibility and usability are words I use very frequently when providing feedback, but it’s really worthwhile. Oh, and Lisa also kept saying accessibility expertise when building a website is essential. After having learned a fair amount at work and in my reading about accessibility, usability and web standards I really cringe when I think of that website I built about five years ago that used frames before I really knew about CSS etc. There were other sessions I attended but the ones I’ve written about I found the most interesting. And before we all knew it the conference was over and it was off to a nearby venue for the after party sponsored by Microsoft. It was a good way to finish the conference and I met some people I hadn’t met yet. Consequently my Facebook contacts have expanded threefold and now I can see a good use for Facebook. Hint, these sorts of contact details are on my About page. I also cringe when I think about some of my old sites, but that’s how it was back then and you know what… we’ve learnt and moved on, so that’s a good thing. I’m really happy you got something out of the preso, particularly given how much experience working online you already have. I enjoyed your summary comments on innovation. Google certainly is one of the prime examples, in my view. It seems to me that part of the key in innovating–especially for medium to large size organizations–is tolerance for some chaos. Meaning, a loosening of rigid top-down control. Sure, structure is required, like clear policy and as process, especially around business critical tasks. Providing 20% (that’s quite a bit) of time to work in a less structured way is brilliant. As you might be aware, many Googlers contribute to projects outside their department or group, which creates great cross-pollination in the work force.